Sometimes as T. capitata rubra or T. capitata ‘Roja’. See Detective Derek 02/15. 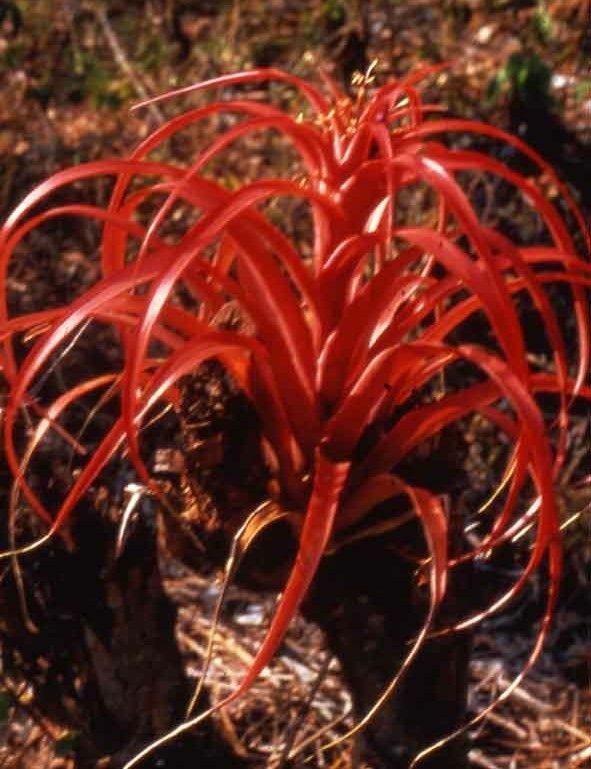 In the 1970’s a collection of red leaved Tillandsia ‘capitata’ was made from the area of Pochutla, Mexico and were propagated in California mainly by Bird Rock Tropicals and Rainforest Flora. 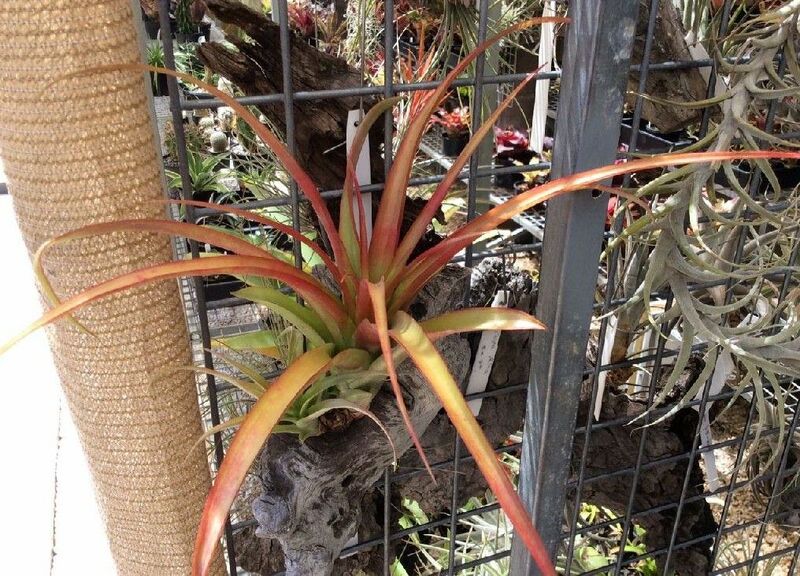 These were sold by Bird Rock Tropicals as T. capitata rubra and Rainforest Flora as T. capitata ‘Roja’. 1. - Forget about its identity. A nurseryman would not use these options but needs a name and invariably this is an adjective like; short, long, select, white, red etc. Sometimes these adjectives are given Latin equivalents but this is where they fall foul with the ICN rules for wild collected plants where formal descriptions etc are required. They also fall foul under the ICNCP rules for cultivated plants because NEW names in Latin are not allowed. So ‘rubra’ is not acceptable. Let us now look at colour which the ICNCP rules also frown upon because it is ambiguous. For example think about the name Rosa ‘White’ or even Rosa floribunda ‘White’. You would think the namer would use more imagination. Now let us look at when colour is expressed in another language. There is no set rule on this but ‘Roja’ can be Spanish for red or rose. These sorts of words creep in as cultivar names but are borderline. In January 2015, the name ‘Roja’ was registered in the BCR because it is widely grown around the world under this name, but no mention was made of where it was collected. Pam Hyatt of Bird Rock Tropicals has suggested that both ‘Roja’ and the illegitimate ‘rubra’ are the same as a plant that Renate Ehlers investigated from a botanist point of view. Wuelfinghoff collected a plant near Pochutla in May 1986 and in 1988 Renate went to the site and collected EM881303. She described it as growing by the thousands, saxicolous and epiphytic, along the main road from Pochutla to Miahuatlan, Oaxaca. 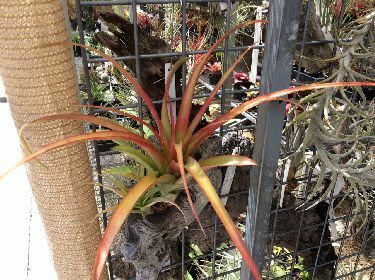 It is bigger than T. brachycaulos, has thin red leaves and looks in between T. capitata and T. brachycaulos. She referred it to Walter Till and Harry Luther. 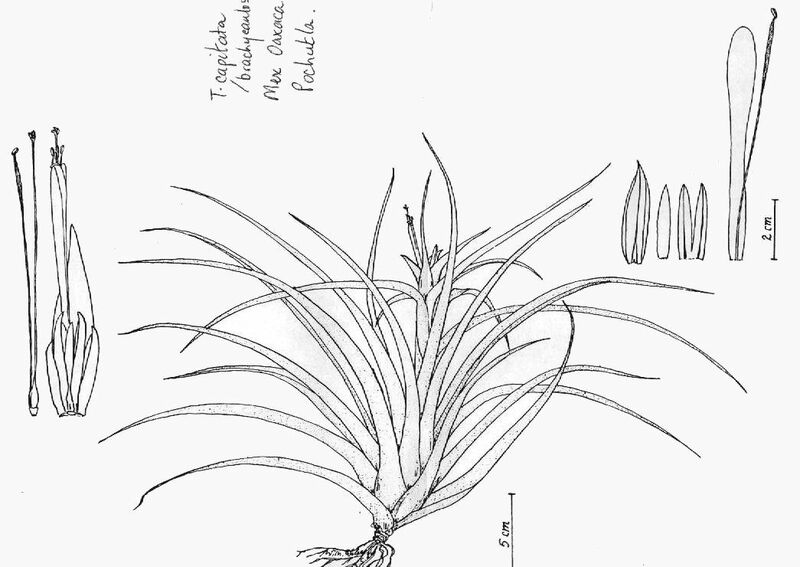 Harry suggested links to T. cryptantha Baker. T. cryptantha was considered a synonym of T. brachycaulos in Smith & Downs 1979 but resurrected to species status by Gardner in 1982. Nothing further was done although Weber did a drawing, see attached. In 1995 I was able to import a plant from Renate and it flowered and a few offsets were distributed around Australia as ‘Pochutla’ with a note that it was somewhere between T. capitata and T. brachycaulos. For this reason I am registering the name ‘Pochutla’ so that the history of this plant can be recorded. I leave growers to decide what they think the name of their plant should be. Ray Clark ... "This "Capitata" came from Derek Butcher in Feb 2011. So I am assuming provenance from Renate Ehlers and will update label accordingly. I like this particular plant as it is reasonably forgiving weather conditions wise and usually looks as it does today, tidy growth habit and colours up with a bit of sunlight."